Kings Modular Cutlery - A comprehensive range of individual cutlery items. The range covers: standard, angled and specialised utensils, to be paired with built-up, slim, contoured, lightweight or heavyweight handles. All items are hygienic, non-corrosive and dishwasher safe. 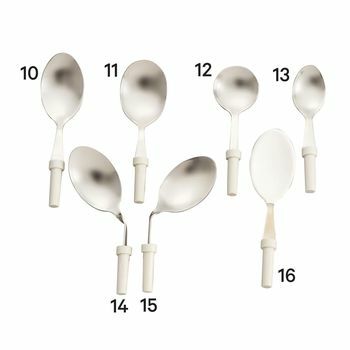 The utensils are mounted with plastic spigots that are pushed in, to tightly fit around the chosen handle, but allow the blade to be angled as desired.